Infused with peppermint and notes of citrus for a fresh fragrance that evokes nostalgic memories of summer vacations at the beach, while leaving an invigorating and refreshing sensation. Aqua, Sodium Laureth Sulfate, Cocamidopropyl Betaine, Coco-Glucoside, Sodium Chloride, Betaine, Parfum, Cocamide Mea, Benzyl Alcohol, Polyquaternium-7, Dipropylene Glycol, Malic Acid, Menthyl Lactate, Menthol, Disodiumedta, Ethylhexyl Methoxycinnamate,Benzophenone-4, Glycine, Ppg-9, Butylene Glycol, Propylene Glycol,Mentha Piperita Leaf Extract, Methylchloroisothiazolinone, Sodium Hydroxide, Methylisothiazolinone, Fucus Vesiculosus Extract, Ci 15985, Ci 42090, Limonene, Linalool. Aqua, Cetearyl Alcohol, Behenamidopropyl Dimethylamine, Parfum, Dimethicone, Stearyl Alcohol, Lactic Acid, Isopropyl Palmitate, Benzyl Alcohol, Propylene Glycol, Mentha Piperita Leaf Extract, Disodium Edta, Menthol, Menthyl Lactate, Glycerin, Glycine, Distearyldimonium Chloride, Ethylhexyl Methoxycinnamate, Malic Acid, Benzophenone-4, Aleurites Moluccana Seed Oil, Methylchloroisothiazolinone, Methylisothiazolinone, Limonene, Linalool. 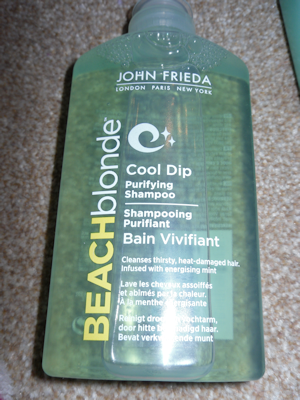 The thing I like about the packaging is that it ties in nicely with the theme and the name for example ‘beach blonde’ and the colours they have used which would be the mint colour. They fit perfectly together and it really compliments it really well. I absolutely love this combination. It smells so fresh and leaves your head tingly which is a great fresh feeling and it is a gorgeous smell. It gives the best looking beach hair. 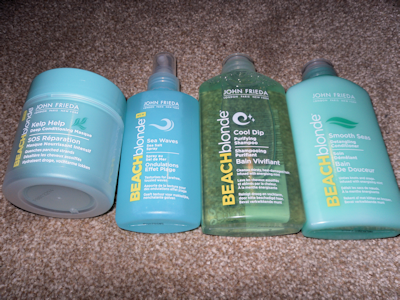 My head does not usually cope very well with shampoos and conditioners and its really hard to find one which doesn’t make my head itch or irritate it but once again as of many John Frieda products it works well with my hair and head. They are all gentle on the scalp and my hair felt cleansed and not knotty (for once in my life) The shampoo also gives a good lather. You may be think well why is she reviewing a product that is called ‘beach blonde’ shes not blonde. Well the answer to your question is it is not to just be used on blonde hair as it states that it is suitable for all hair colours and types. 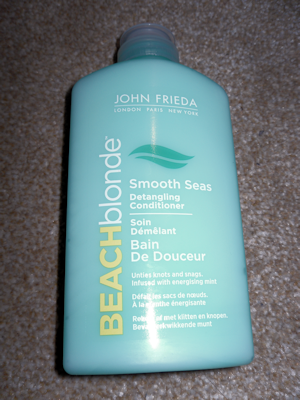 The reason it is called beach blonde is because generally people with blonde hair have their hair damaged more by the sun and this is what the shampoo and conditioner is trying to achieve (repair the dead blonde hair out there). 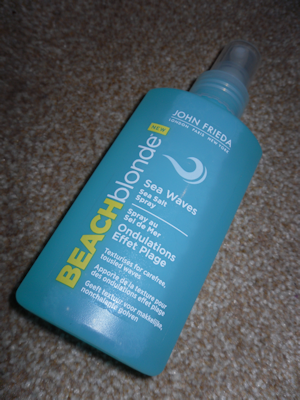 It gives you a beautiful beach look and compliments your hair really nicely. Sitting on the shelf it would attract you to this line because they’re completely different and not only are they completely different but it also comes in a bottle instead of a tube which is so much more handier but it is eye catching. 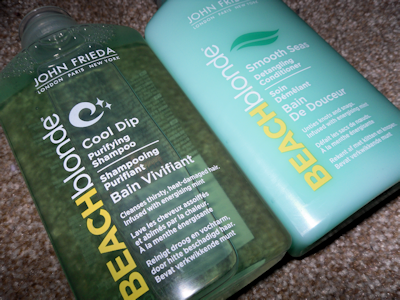 I would 100% recommend these to friends I love John Frieda products. I absolutely love what it does to my hair. Replenish dry, damaged and difficult-to-style hair with our strengthening formula, and prep for an effortlessly tousled beach style with ease. With a unique blend of targeted conditioning agents, Monoi Oil and Kelp, this formula seeks to restore critical moisture to damaged hair fibres, restoring silky-suppleness. Infused with mint and notes of citrus for a fresh fragrance that evokes nostalgic memories of summer vacations at the beach, while leaving an invigorating and refreshing sensation. Aqua, Cetearyl Alcohol, Dimethicone, Behenamidopropyl Dimethylamine, Glycerin, Parfum, Stearyl Alcohol, Cetyl Esters, Isopropyl Palmitate, Benzoic Acid, Benzyl Alcohol, Lactic Acid, Propylene Glycol, Behentrimonium Chloride, Mentha Piperita Leaf Extract, Disodium Edta, Menthol, Menthyl Lactate, Polyquaternium-28, Glycine, Malic Acid, Ethylhexyl Methoxycinnamate, Benzophenone-4, Caprylic/Capric Triglyceride, Laminaria Ochroleuca Extract, Methylchloroisothiazolinone, Cetearyl Glucoside, Methylisothiazolinone, Prunus Amygdalus Dulcis Oil, Cocos Nucifera Oil, Gardenia Tahitensis Flower Extract, Ci 15985, Ci 42090, Limonene, Linalool. I think this product is absolutely amazing. My hair is quite dry at the best of times and this helps it 100%. 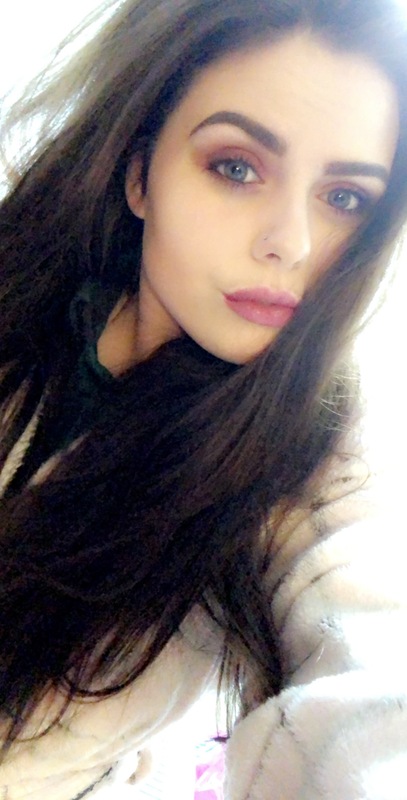 I usually leave it on for around 10-15 minutes and i can honestly say it made the world of difference. It was so nice and really soft and silky. You also only need a little bit as a little goes a long was and a bonus is it smells lovely too. It makes you feel fresh and clean. I have never ever used a product quite like this before I absolutely love this product. It also de-tangles my hair which helps because if you haven’t already read my posts previously my hair is an absolute nightmare. I will definitely be re-purchasing this once it has run out. I have used this product 5 or 6 times in all and now I use it once of twice a week as it really does make a difference to my hair. This is a product that I would definitely recommend to others no matter what your hair type is and I would 100% recommend it to friends also. Create beach-tousled waves for an effortless, matte-textured style, any time of the year. Innovatively formulated with sea salt, this formula ensures soft, natural-looking textured waves. Provides subtle volume and fullness. Infused with a delicate, ocean-fresh coconut fragrance that evokes nostalgic memories of summer vacations at the beach. Allow your hair to dry naturally, blow-dry or diffuse, then finish with Sheer Blonde Crystal Hold Shape and Shimmer Hairspray for a long-lasting style. This weightless styling mist can also be applied to dry hair to instantly refresh your tousled style. Again this product is for all hair types despite the name. I am really impressed on how it works as it makes my hair really soft the smell is also again gorgeous. It didn’t give me hard or crispy hair which I hate it when my hair goes like that. Most salt sprays tend to weigh down your hair but this one doesn’t. This is an amazing product and the smell is coconut which I think most girls love. It is easy to use and enhances natural waves. The results are extremely good for thick hair as well. It gives a beautiful texture and I love this product so much. I carry it around in my bag 24/7 as well and it is a definite must have. I would recommend this to friends and family and would buy it as a gift.